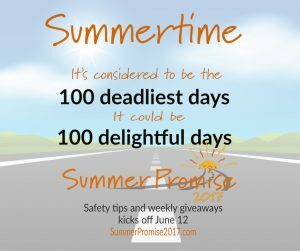 Happy Summer Days or the 100 Deadliest Days? Is summer driving really more dangerous than winter driving? Icy and snow covered roads, shorter daylight hours, and ice build-up are certainly dangerous. The spring thaw can cause flooding roads and mudslides. Yet more teens die in crashes between Memorial Day and Labor Day. According to the Insurance Institute for Highway Safety (IIHS), the month of August had the second highest number of fatal car accidents in 2014, with 3,037 (right behind October’s 3,068). What’s more, June, July, and September each had over 2,800 fatal accidents themselves. But it’s not just inexperience alone. And that means more drivers on the road. When school’s out, more teen drivers hit the roads. Sadly, more teen drivers on the road can mean more danger for the rest of us. The unavoidable lack of experience (we’ve all been there) can lead to questionable judgment that can increase the risk of an accident. And data shows that teens are more likely to be involved in accidents than other age groups. Distraction plays a role in nearly six out of 10 teen crashes, four times as many as official estimates based on police reports. The top distractions for teens include talking to other passengers in the vehicle and interacting with a smart phone. In 2015, the latest data available, 60 percent of teen drivers killed in a crash were not wearing a safety belt. Teens who buckle up significantly reduce their risk of dying or being seriously injured in a crash. The 100 days includes popular drinking holidays like Memorial Day, Fourth of July, and Labor Day. Teen drinking is a bigger deal than you might think. The law says it’s illegal to drink under the age of 21; and it’s illegal for someone under 21 to drive after drinking any amount of alcohol. Because of their age and developing body, teens dangerously get drunk twice as fast as adults and have more trouble knowing when to stop. The teen body is not prepared to protect itself from the effects of alcohol the way an adult body is. Speeding is a factor in nearly 30 percent of fatal crashes involving teen drivers. A recent AAA survey of driving instructors found that speeding is one of the top three mistakes teens make when learning to drive. Vacationing drivers are often unfamiliar with the roads, as well, which can lead to erratic or unpredictable driving (especially when there’s something cool to look at). And because they’re unfamiliar, they may drive too slowly. Many cyclists and bikers take advantage of the warm weather by finally getting their vehicles out of the garage and onto the streets, which makes sharing the road a priority for drivers. Driving alongside cyclists can make traffic maneuvers, from turning right to parallel parking, more dangerous. The IIHS reports that 720 cyclists were involved in fatal accidents with motor vehicles in 2014 alone. Summertime is a popular time for road construction. The Centers for Disease Control and Prevention reports that construction and maintenance work zones averaged 773 driving fatalities per year from 2005 through 2014. Always be a little extra cautious when you drive around construction zones. As AAA explains, hot weather causes the air inside your tires to expand, which can lead to a blowout in well-worn wheels. Check your tires on a regular basis during the summer months, especially during heat waves. The scorching summer sun can dehydrate you on long drives, so keep a bottle of water handy. And of course, the chance of your engine overheating increases, especially if you have to rely on your air conditioner to keep yourself from overheating. If your engine overheats, pull over to let it cool down. So how can we change this from the 100 deadliest days to the 100 delightful days?